Dividend = (divisor*quotient) + remainder. The above relationship holds good for polynomials also. (Divisor*Quotient) + Remainder = (3xyz * 19xyz) +0 = (3*19)*xyz*xyz +0= 57x1+1y1+1z1+1+0=57x2y2z2 which is dividend! The quotient has two parts – coefficient and variable. How do we get these? 1. Divide each term of the polynomial by the monomial. 2. The partial quotients when expressed collectively become the quotient of polynomial. If any term of a degree is missing in dividend or divisor, add that degree with coefficient as 0. Hence, x2 is the first term of the quotient, write this term on the top of the dividend. Take term of next degree (=-6x) from the given dividend and write it next to the result got in step 5. 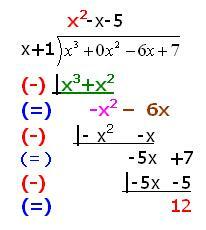 Though, the dividend is in descending order of power of x, we need to have missing terms of powers of x (x4 ,x3). This is done by having their co-efficients as zero. The dividend is re written as x5 +0x4 +0x3-9x2 +12x-14. The divisor is already in descending order of power of x. We can verify the solution by doing proper multiplication of terms. Since terms are big, let us verify by an alternative method of substitution. Synthetic method (Horner’s method) of division when the divisor is of the form x-a. We shall describe this method by taking the problem which was worked out earlier (2.10.3 Problem 2). Write the dividend in its standard form as: 1x5 + 0x4 + 0x3 - 9x2 + 12x - 14. Write the co-efficient of the first term of the divisor (in this case 1) in the corresponding column of the third row down below (in 2nd column). starting from this column in the third row, write the product of divisor (in this case 3) and the number in this column (in this case 1) in the next column of 2nd row (in this case 3*1=3 in the 3rd column). Add these numbers in the 1st and 2nd row (in this case 0+3=3) into the corresponding column in the third row. Repeat this process till the result in the last column in the third row is got. The value in the last column of the third row gives the reminder. Let us take the polynomial 4023m2n2 - 6032m2n - 8042m3 n4. Since this polynomial contains m and n as variables we can denote the same by f(m,n). f(m,n) is pronounced as ‘function of m and n’. a0,a1,a2,……… an-1 and an are called ‘co-efficients’ of x0,x1,x2……. xn-1 and xn respectively. n is called the ‘degree’ of the polynomial. Each of anxn, an-1xn-1,………. a2x2, a1x1, a0 are called the ‘terms’ of the polynomial. If for any value of a (x=a), f(x) = 0, then we say that ‘a’ is a ‘root’ of the equation f(x)=0. Thus 0 and 2 are the roots of the given polynomial but 1 is not. Since degree of f(x) is 2 and it has a common factor, the degree of the factor has to be one.